As part of the post last week about the EverQuest progression servers that Daybreak announced for the 20th anniversary, Bhagpuss and I ended up exchanging comments about the tutorial. There is a tutorial, though it was added at some point well after launch. Neither I nor Bhagpuss nor Google could say exactly when… so if you know, here is an opportunity for you to leave a comment… and it has been through various iterations, so there is probably somebody out there who longs for the “classic” tutorial. Anyway, I said that, despite its unknown provenance, I kind of like the tutorial. I’ve been through it a couple of times, though not recently. In fact, I think the last time I went through it was when Daybreak opened up the Vox server, which I think coincided with the game going free to play… which would make it 2012. Anyway, all this thinking about it made me want to go try it. At least it would get me warmed up for the game in time for the big day next month. 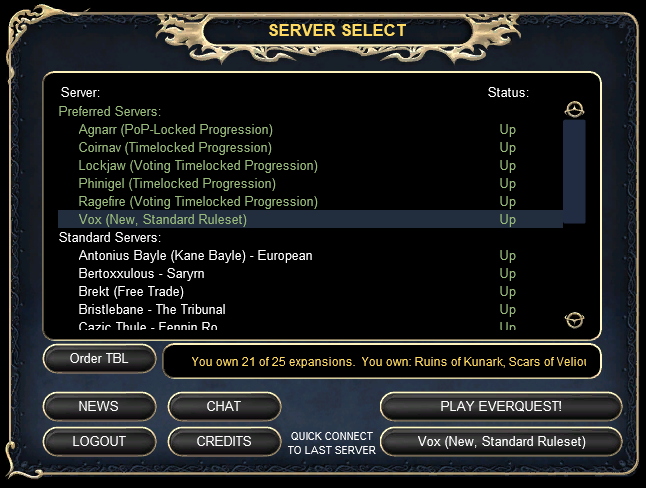 So I cranked up the EverQuest client, logged in, and looked at the old server list window once again. There I realized that I was still subscribed to Daybreak All Access. I mean, I knew that in some part of my brain… and I’ve let it slip some since I was playing EQII late last year because I did the three month at a go subscription, but they stop giving you Daybreak Cash if you unsubscribe early and so I let it run, log in to collect, but lose track of the point when I should subscriber… so they’ve clearly got my number on that one… but the fact that I had all the pay to play progression servers on the list kind of pressed that home on me. Also, I like the little scroll window that first tells you how many of the expansions you own… a useful number I suppose… and then proceeds to list out, by name, in order, all of the ones you do own, followed, again by name and in order, all of the ones you do not. Given that there are now 25 expansions in the wild, that can take a while, even if most of them are just three word names. I had to wait a bit for the scroll to come around so I could get a screen shot with my own count. I own everything through The Darkened Sea, which was more than I could mentally account for… but whatever. Even watching that list scroll past I kept seeing names that seemed like they only just shipped, but. Everything from House of Thule forward seems like it was recent. Once I was done staring at that I decided to go back to the Vox server once more. I have characters on all of the progression servers… my thing seems to be to at least roll up a character and stand out in front of Qeynos even if I don’t play… but I wasn’t sure where any of them stood these days and I didn’t want any special rules of restrictions. I wanted the tutorial. So Vox it was. I already have four characters on Vox, three in their low 20s and one at level 85 from that time they gave a free boost and then I couldn’t get to where the game was telling me to go. That was almost five years ago. 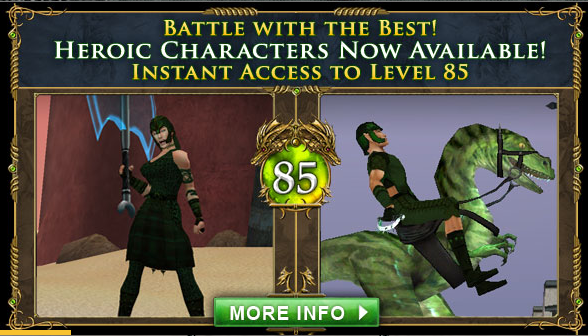 Also, I thought surely the launcher was wrong when it was telling me about level 85 boosts. But, again, I wasn’t here to boost, I was here for the tutorial. So I rolled up a fresh character. I had already done the usual suspects on Vox already, a paladin, a shaman, a warrior, and a druid, so I went out for something I hadn’t looked at in a while. I considered a bard. I do love EverQuest bards. However, bards have always seemed like more of a group oriented class to me, and I wasn’t planning to group. Instead I decided to go for a cleric. EverQuest clerics are good, old school clerics, wearing heavy armor and beating people with blunt objects. I like a healer that can take a punch and have always been a bit chagrined in WoW with cloth wearing clerics. I mean, sure, they have mind control. But wearing cloth like some sort of common mage? But I guess you have the paladin if you want an armored cleric in WoW these days. I ended up with a dwarf cleric named Dolenz because I was thinking about Circus Boy the other day or something. I clicked the tutorial option… it is a bit confusing, because there is a button there on the character page that says “Tutorial” but I wasn’t sure what it did, so I clicked it a couple of times and figured it was just a toggle to indicate whether or not you wanted to go through the tutorial. But then I couldn’t remember its initial state and, honestly, even if I did remember, it was not clear to me which state got me into the tutorial and which would drop me straight into Norrath. Whichever I ended up choosing, it turned out to be the right one, because it sent me into the tutorial as I had wanted. The tutorial, unlike a lot of what I remember about EverQuest, has a story of sorts. It isn’t a very original story. You’ve been captured by kobols and are in kobold jail and have to escape… because by industry convention all RPG starting stories must be a jail break or a ship wrekck scenario… and after a bit of an intro you end up in a room with a shirtless barbarian named Arias who has come to help. Arias takes you under his wing and introduces you to the basic concepts over EverQuest, like movement, the quest log, looting, and beating the tar out of kobolds. I recognized the quest log, was hazy about being able to click on the keywords in dialog rather than having to say them, and was surprised a bit by the looting mechanism, which was a new one on me. Well, new-ish. It seemed to be very similar to what I saw had ended up in LOTRO when I came back for the legendary server there. It looks a little better in LOTRO, but it seems to act about the same. And it was comforting. One of the things I forgot to mention in my ramble about returning to World of Warcraft was how, after three months in Middle-earth, I kept forgetting to loot. You get used to the loot just showing up in a window for you to pick and choose among. After looting that key and learning again how to hand it to an NPC, Arias led us out of the initial story and into thee stronghold of the revolt. From there I was set to learn a whole range of game mechanics. But I will pick that up in the next post. This entry was posted in entertainment, EverQuest and tagged EverQuest 20th Anniversary, Vox on February 19, 2019 by Wilhelm Arcturus. 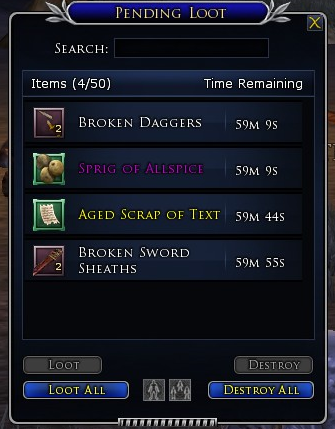 That modernized loot system in Everquest is my favorite in all MMOs right now. I was playing EQ today (this anniversary thing is working it’s magic already and we aren’t even there yet) and I just felt spoiled by how convenient and controllable the loot options are. Youdon’t have to use them, you can toggle the whole thing off and pick up your gnoll teeth straight from the gnoll if you really want to, but even though I used to be a big advocate for body loot I don’t feel the need to go back. I think the reason you have so many expansions is because everyone gets automatically credited with them up to a certain point. I’m not sure what that point is but it looks as if it might be three expansions in arrears. I am currently up to House of Thule, in that I have a character who can solo enjoyably in the opening zones there. Technically at level 93 she should be in Veil of Alaris, the next one along, but I tried that and it wasn’t fun. House of Thule itself came out in 2010 so I’m close to a decade behind and I doubt I’d even be there if I hadn’t used one of those Level 85 boosts. My Beastlord, previously my highest character, levelled legitimately from creation to the low 80s but she was really struggling. The Magician is a much better solo class so I bumped mine from the mid-60s to 85 and over the last few years she’s slowly crawled up another eight levels. No need to hurry. I never really liked Mines of Gloomingdeep much although it is very well done. I think you can get to something like Level 15 there if you really do everything. I used to go in and get the charm, back when that was a big deal, then leave. Later on they changed it so you can go back in at a later stage, or I think they did, so you could get the charm on any characters who’d missed out. I doubt that charm’s much use now anyway. Good luck with your cleric. I absolutely loved playing a cleric in EQ… back in 2003. It’s the best group class I’ve ever played and for years afterwards I only really wanted to play healers in groups. Higher level clerics also solo well but it can be painful at low levels. I haven’t tired it with a mercenary though. That might speed things up. Walk up to a Halas guard and type in ‘hail’ without pressing Enter first. @Dorath – Making the “A” the auto-attack key certainly led to some high comedy back in the day. I remember just barely making it to the zone line in front of North Qeynos with the guards in chase. Fortunately the zone line was pretty close. @Telwyn – If you have a group, the tutorial is nice because you get geared up, but after that I might head out into the world to do some of the open dungeon areas. I think you’re not beyond Blackburrow at 10 and you’re getting into the level range for the Estate of Unrest and the like. Those are fun places for groups to setup. In your 20s you start unlocking the Lost Dungeons of Norrath content, which can be a good change of pace and is a way to update your gear. I don’t mind the content from The Serpent’s Spine, but it is very linear and quest oriented, which isn’t what classic EQ was really about to my mind. It was an attempt to be WoW-like in Norrath.